The fourth Session (Budget Session 2015) of 16th Lok Sabha commenced on 23rd Feb 2015. The first Part of the Session ended on 20th March 2015. The Second Part will start on 20th April 2015 and go upto 8th May 2015. 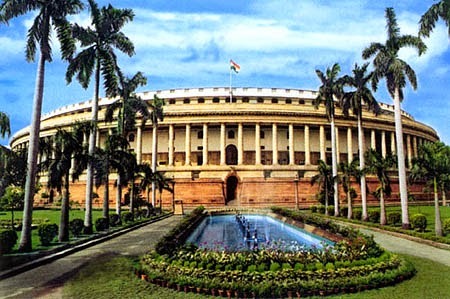 The first sitting of the 16th Lok Sabha commenced on 4th June 2014. Till the end of 20th March 2015, Lok Sabha sat for 74 days (till the end of Part I of 4th Session). During this 74 days, Members in Lok Sabha participated in 6686 debates, introduced 206 bills and raised 28345 questions, which included supplementary questions. Based on the data released by PRS India, we have analysed the performance of our Lok Sabha MPs. The performance of the MPs are analysed on the basis of their performance in (a) debates (b) private members bills and (c) quetions. The top 10 performers of the MPs, based on the total scores are given below. Out of this 10 MPs, 4 MPs are first time MPs. Congress leads with 3 MPs, followed by Shiv Sena, NCP and CPIM with 2 MPs. There is only one MP from BJP. Interestingly 5 Maharashtra MPs and 3 Kerala MPs have found place in the TOP 10 CLUB. Karnataka and Rajasthan have secured one MP each. Shri P P Chaudhary (BJP MP from Rajasthan) has topped under this category with participation of 90 debates. He has secured 100% attendance. He shares the first position in the TOP 10 CLUB also for total tally. Shri P K Biju (CPIM MP from Kerala) secures second position with participation of 81 debates. He has attended 95% of the sittings. Shri Bhartruhari Mahtab (BJD MP from Odisha) and Shri Om Prakash Yadav (BJP MP from Bihar) have introduced 10 Private Members Bills each. However, both of them could not enter into the TOP 10 CLUB, as their total tally is only 204 and 92 respectively. Shri Chandu Barne Shirang (Shiv Sena MP from Maharashtra) secures first position with 259 questions at his credit. He has attended 88% of the sittings. He has also secured No 1 position for overall tally in the TOP 10 CLUB. Shri Shivaji Adhal Rao Patil (Shiv Sena MP from Maharashtra) shares the first position with 259 Questions at his credit. He has attended 72% of the sittings. He was one of the Sansad Ratna Award Winners for the 15th Lok Sabha also. Smt Supriya Sule (NCP MP from Maharashtra) secures the first position among the women MPs with total tally of 264 (attendance 91%). She is in the TOP 10 CLUB also. Smt Shobha Karandlaje (BJP MP from Karnataka) has secured the second position with a total tally of 236 (attendance 99%). She is the first time MP. Shri Chandu Barne Shirang (Shiv Sena MP from Maharashtra) and Shri P P Chaudhary (BJP MP from Rajasthan) share the first position with total tally of 285. Interestingly, they share the first position in the TOP 10 CLUB also. Debates: Average participation of the Members of Kerala and Rajasthan is 37.4 and 24.8 under debates. National average is 13.5. The performance of West Bengal Members is the lowest at 8.2 per member. Questions: Here Maharashtra and Kerala have swapped the position. The average questions raised by the Members of of Maharashtra and Kerala is 120 and 116. Again West Bengal retains the last position with an average of 21 Questions per Member. The National Average is 57. Attendance: National Average is 85% per Member. Tamil Nadu and UP secure the top position with 93$ and 91% repectively. Here also West Bengal retains the last position with average 72% attendance. In short Maharashtra and Kerala have been performing excellently well till now. Members of West Bengal are performing badly in all parameters. The Sansad Ratna Awards for the first year of 16th Lok Sabha will be given at Delhi during July 2015, based on the performance of MPs till the end of Part II of Budget Session 2015. Analysis by K. Srinivasan, Convenor, Sansad Ratna Award Committee.